If ghosts do exist, and if these spirits roam the earthly realm they inhabited in life, then a tall, thin, angular spirit must move throughout the Storrs campus with ease. The spirit of G. Safford Torrey can certainly be found in the halls of the Life Sciences building that has borne his name since October 18, 1980, and among the plant collections that he nurtured and expanded. It's carried by the wind in the notes of the carillon bells of the Storrs Congregational Church. And it mingles with the rising spirits of degree candidates, as annual academic processions march toward Commencement, and with the pride of students inducted into Phi Beta Kappa. 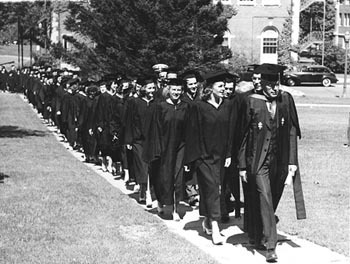 G. Safford Torrey, University Chief Marshal, leads graduates to Hawley Armory for Commencement in this photograph from the 1940. Photo courtesy University Archives & Special Collectio. Born in 1891, Torrey came to Connecticut Agricultural College in the fall of 1915 to teach botany, after receiving his bachelor's and master's degrees at Harvard. He was to serve on the faculty until his retirement in 1956, with a 14-month absence for service during World War I. In 1921, Torrey married Elizabeth Tapley, a graduate of Mt. Holyoke College and a secretary to the director of the CAC Extension Service. The Torreys had four children, two sons and two daughters, born between 1922 and 1933. The family moved to a house in Gurleyville in 1926. When Torrey began his career at Connecticut Agricultural College, he made up half of the botany department. Two courses were offered at the time. With Edmund Sinnott, who joined the botany staff the same year, he reorganized course offerings and by 1918 there were 10 courses for students. Torrey eventually taught the introductory botany course, plant pathology, lower plants, and field botany. His main interest was fungi, but he also had an extensive and detailed knowledge of the flora of New England. Torrey became head of the Department of Botany in 1929 and served in that role until 1953. The staff remained at two until 1948, when the post-World War II influx of students resulted in the addition of three full-time faculty and one full-time assistant instructor. That was the size of the department when Torrey retired in 1956, with 23 courses offered. On his arrival in Storrs in 1915, Torrey found a small herbarium at Connecticut Agricultural College, limited largely to plants of New England. Included was a small collection labeled "college campus", and "Torrey recognized at once that this latter group of plants were mislabeled and belonged to another part of the country." Later he learned that the plants were brought by a predecessor, who had collected them at Texas A&M University in Brazos County, Texas. After the college became the University of Connecticut in 1939, gifts began to come to the herbarium, including in 1948 an extensive and valuable collection of Edwin H. Eames of Bridgeport, whom Torrey considered "the leading amateur collector in the state." Torrey continued to tend the herbarium collection after his retirement. In his early years at Connecticut Agricultural College, Torrey served as chair of the Scholastic Standing Committee, and since he was also the college's registrar from 1919 to 1926, "he exerted considerable influence on the establishment of standards for admission to the University, as well as on the application of these regulations to individual students," wrote Barnett. Torrey chaired the committee for many years, and he was a familiar figure at each Commencement, heading the processional, usually to Hawley Armory, as chief marshal. Torrey also was active in the Storrs chapter of the American Association of University Professors, and was elected national chairman in 1938, defeating a candidate from Yale. A member of Phi Beta Kappa at Harvard, Torrey was active in attempting to establish a chapter at UConn. In 1949, the University's application was rejected, on the grounds that it did not offer regular courses in Latin and Greek, the budget for arts and sciences was inadequate, and the housing of departments in arts and sciences was poor. With new buildings housing liberal arts, however, and expansion of the curriculum in the noted areas, the faculty decided to try again for a Phi Beta Kappa chapter under Torrey's leadership and in 1955 the application was accepted. Torrey presided over the installation of the Epsilon Chapter in a ceremony held as part of the University's 75th anniversary in April 1956, the same year he retired. Since his arrival in Storrs, Torrey had been a member of the Storrs Congregational Church, becoming organist and organizing a choir. He directed the choir until 1931, when Herbert France was hired to head the college's music department. That same year, the Austin Cornelius Dunham Carillon, bought by the college, was installed in the tower of the church. For many years, Torrey played the carillon at Commencement, for weddings and funerals, and frequently after church services. On Easter Sunday he played before the sunrise service; as well as at midnight each Christmas Eve and New Year's Eve. In 1951, he began tutoring Jack Lamb, a member of the faculty and the church, and when Torrey's health began to decline in 1964, Lamb took over more and more of the playing. Torrey stopped playing when doctors advised him that the climb up the church steeple was too strenuous for his heart. Safford Torrey died on August 19, 1977. Two years later, trustees voted to name the Life Sciences building in his honor, "recognizing his long and valued service to the University of Connecticut. Archival materials, including a series on UConn history by Barnett, are in the Archives and Special Collections of the Thomas J. Dodd Research Center.